It was probably a feature in the dearly-departed Dreamcast Magazine, some time after the game’s TGS ’99 reveal, and from the moment I saw it, I knew I had to play Jet Set Radio. From the incredible cel-shaded art-style that exuded that street-punk attitude that serves as its thematic foundation, to the central conceit of the game – namely, tagging graffiti to mark your gang’s territory – to the saturated colours of the Tokyo streets against that trademark Sega blue sky. Everything about this game arrested my attention. I couldn’t wait to play it. And then, months later, thanks to a demo disc attached to the cover of the aforementioned publication, I got my chance. And I hated it. I couldn’t get my head around the controls for a start, which meant I had trouble getting around the environment, which meant I couldn’t escape the rampaging police, which meant I couldn’t find the time to paint. And on the off-chance that I actually managed to get to a tag site, I couldn’t seem to get to grips with the graffiti mechanics, either. But I had been so looking forward to the game that I decided I had to try it again. And again. And again and again. And all of a sudden, it just clicked. Everything came into sharp focus; I knew what the game expected of me, and I understood how to make it happen. Get some speed behind you, grind that rail, make that jump, ride that wall. The floor is lava. Smilebit’s 2000 Dreamcast title has since become a cult classic, leading to Sega and BlitWorks releasing an excellent HD version on literally everything back in 2012. 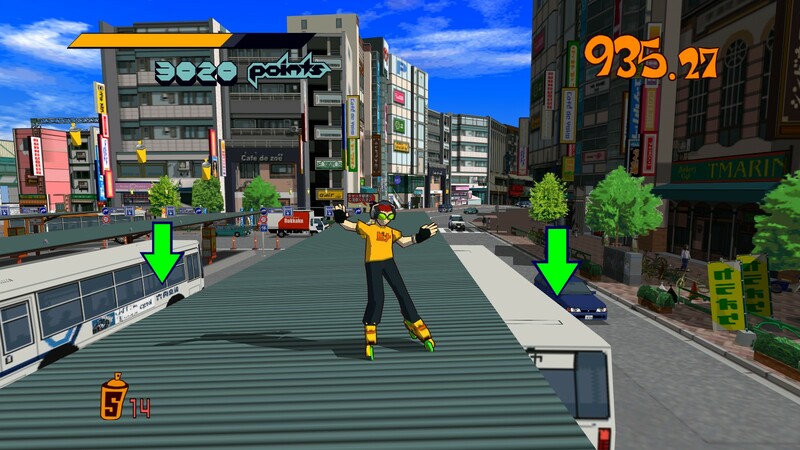 Jet Set Radio presents a colourful, stylised representation of Tokyo, including iconic areas like the Shibuya bus terminal, and stars a cast of punky inline skaters out to grab territory for their respective street gangs. How do you go about this? By tagging the crap out of everything you see, of course! You’ll mark your territory on buses, cop cars, advertising hoardings and storefronts as you claim turf from rival gangs the Love Shockers, Noise Tanks and Poison Jam. Naturally, the police, led by the hard-boiled Captain Onishima and backed by the shadowy Rokkaku Group, don’t take kindly to your urban artwork. These crazy keisatsu will do anything, including calling in helicopter gunships, to put an end to your adolescent fun. Right from the off, Jet Set Radio demands that you get good. Just as the controls take a little time to puzzle out, so do the level layouts; very early on, you’ll learn to prioritise the larger, more time-consuming tags before the police escalate their presence, bringing in tear gas troopers, assassins armed with electric whips and black-suited knife-wielding goons, all of whom make it a very bad idea to stand still and tag. You’ll soon realise it’s best to leave the simple, one-hit tags ’til the very end of the level so that you can grind, trick and race past your aggressors, tagging as you go. This means that you’ll ideally spend the first minute or so just skating around, getting the lay of the land and collecting spray paint cans, before launching your carefully-planned graffiti assault on the streets of Tokyo-to. The first thing you’ll notice – and indeed, the thing the game is probably still best known for – are those striking, pioneering cel-shaded graphics that make Jet Set Radio look like a Gainax anime come to life. We see the technique a fair bit these days, and 2002’s The Legend of Zelda: The Wind Waker arguably brought it to more mainstream attention, but back in 2000 it was absolutely state of the art; really, it had only been seen in the character models of Fear Effect, which came out only months before Jet Set Radio. Chief graphics designer Ryuta Ueda wanted to create a snapshot of what he saw as Tokyo’s youth culture at the time, something that reflected the eclectic, high-energy, vibrantly colourful scene he saw around him. It’s not just about those beautiful, flat, shaded polygons though. The game is brought to life by all the little incidental details; the fact that Garam’s necklace looks like it just might be Sonic’s skull, Tab poking his tongue out at you every now and then for no good reason, DJ Professor K’s funky hair that pulses in time to the beat, and the fact that nobody ever stands still. Every character is in constant motion – even leaving your skater idle causes them to dance to their own rhythm, like a way cooler version of Spaced‘s Tires. Touches like this create a tangible, kinetic connection between gameplay and presentation, tying them together with the audio in such a way that every element comes together to create a solid, cohesive whole where every little touch just feels right. The visual presentation is beautifully mirrored by an eclectic, borderline-manic soundtrack from Hideki Naganuma that remains one of the best in gaming. Representing every facet of Ueda’s vision of late-nineties Tokyo street culture, Naganuma’s work takes in hip hop, funk and even acid jazz, interspersing it with odd looped samples (“Will you stop playing with that radio of yours? I’m trying to get to sleep!”). Meanwhile the varied licensed tracklist mixes in the kooky rock of Guitar Vader, the alternative hip hop of Jurassic 5, and even finds space for a track from fellow Sega veteran Richard Jacques (yes, the man behind the indisputably awesome Sonic R soundtrack contributed to Jet Set Radio). While Jet Set Radio didn’t exactly set sales alight, a sequel of sorts was released for the Xbox in 2002. 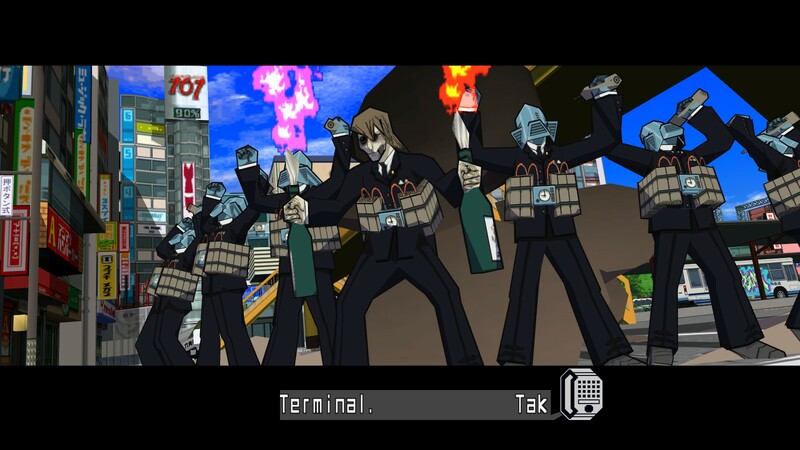 Jet Set Radio Future, as the name suggests, transposed the GGs and their rivals to a near-future vision of Tokyo-to. Characters were redesigned, the plot was shuffled about a bit, and the colour palette was more muted, but the biggest differences were in how the game played. Conventional wisdom holds that you either like one game or the other, and you can’t possibly like both. While this isn’t really true at all, Jet Set Radio Future did do a fair bit to put off fans of the previous game. Future exists almost as a reimagining of the concept, simplifying some things while expanding others. The most immediate changes are the removal of the time limit in each level and a ‘streamlining’ of the way you execute graffiti; whereas you’d copy analogue stick movements in Jet Set Radio, corresponding to broad strokes of paint, in Future you simply pull the trigger as you race past and it all just happens for you. I absolutely hated these changes at the time. Coming from a challenging game where it’s vital to set your priorities and then create the space needed to get things done in the allotted time, Future just felt like it lacked pace, challenge and focus. The differences weren’t all for the bad, however, and the removal of these mechanics makes a lot of sense when you look at what Jet Set Radio Future is, rather than what it isn’t. The size, scale and complexity of the environments have been massively enlarged, with multiple large, vertical spaces leading to and from one another; a time limit would have been a real drag in levels this huge, and its absence lends Future a much more exploratory feel than the original. The level design is also pushed to its limits to accommodate this expanded sense of freedom: larger spaces mean far more routes over, under, through and around the game’s crazed urban landscapes. 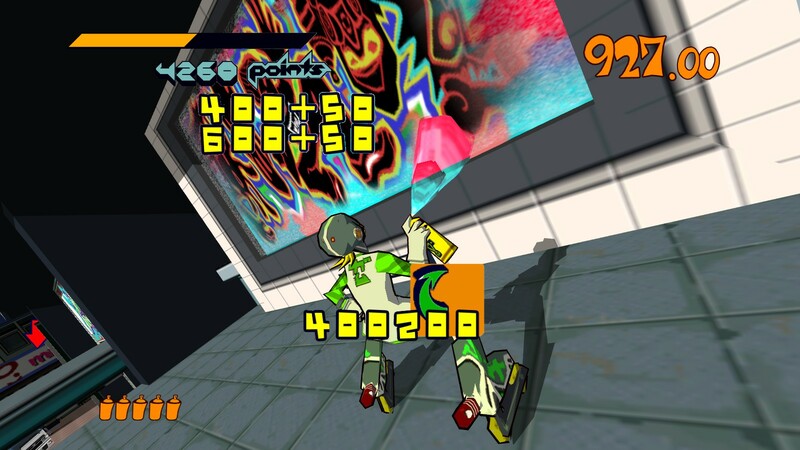 Where Jet Set Radio was a tight, focussed time-attack game as its heart, Future is more like a playground for you to jump, grind, trick and tag through. Jet Set Radio may have been absent for over a decade now, but its influence can still occasionally be felt. Insomniac’s Ted Price has spoken about how the Sega classic informed Sunset Overdrive‘s traversal system, and that game also has a knack of making you feel like a sucker if you so much as deign to touch the ground. Meanwhile, the recent Splatoon will give gamers of a certain age serious JSR vibes, as, like Sunset Overdrive, the game’s visual presentation clearly owes a debt to Jet Set‘s colourful, anarchic sense of fun. How fitting that a project led by a new generation of talent at Nintendo’s famed EAD division should echo a game that looked to celebrate Tokyo’s youth culture in the final days of the 1990s. And what of the team that brought JSR into the world? Well, sadly, we all know about Sega’s troubles since going third-party in the aftermath of the Dreamcast’s premature death, an upheaval that led to internal teams being reshuffled, reorganized and renamed, as well as something of a talent exodus. Both Ryuta Ueda and director Masayoshi Kikuchi went on to work on the Ryu Ga Gotoku series (where they even managed to include a short cameo for JSR bad guy Rokkaku Gouji, later joking that this meant the games existed in the same universe). Ueda has since left the company, along with Hideki Naganuma, who recently suggested that Sega has no interest in reviving the series. Still, with new Sega Games CEO Haruki Satomi recently indicating that Sega want to win back their fanbase, perhaps we will see something done with all those classic IP that are just sitting in a vault somewhere in Tokyo, gathering dust. At the very least, perhaps we can hope for Sega to give us some more of the HD remasters they were offering just a few short years ago, and make Future available for a new audience. Perhaps things are looking up, after all. This is an amazing article for such a beautiful game, ugh. You kept me captivated and that’s what counts. I’m currently in the process of producing a retro gaming blog with reviews such as yours & I would love if you would contribute. E-mail me if you’d like at theretroraider@gmail.com, if not I still think your writing is fantastic! Hi, thanks for the comment, and I’m glad you enjoyed the retrospective! I’m afraid I already contribute to another site, so I just don’t have a great deal of free time. Hope all goes well with the site though, and I’ll definitely visit! This is a game I know I played at some point, but not much as I struggle to remember much about it 😛 The art style has always stuck with me though even to today. The second I see it I know its JSR, though I don’t remember the actual gameplay. Though I think that says a lot. 1. Memory of a gold fish 😛 and 2. it looked awesome!!! Maybe I should give it another blast and see how it grabs my attention! Get the HD version and relive those memories! It really was (and still is) such a visually striking game. I just love almost everything about it. I have the soundtrack and have to give that frequent listens to get my fix!